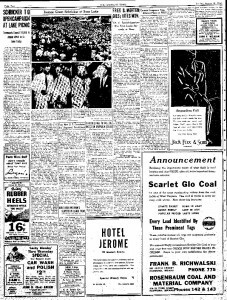 August 17, 1940 – Wendell Willkie accepted the Republican nomination to run for President in his hometown of Elwood, Indiana. Over 260,000 were in the crowd. Willkie became the fourth Hoosier resident to receive a party nomination for President. Indiana’s other presidential nominees included Benjamin Harrison (Republican, 1888), Eugene V. Debs (Socialist, 1904, 1908, 1912, 1920), and Frank J. Hanly (Prohibition, 1916). Willkie lost the 1940 election to incumbent Franklin D. Roosevelt. Willkie received 44.8% of the popular vote, but only won 82 electoral votes to FDR’s 449. 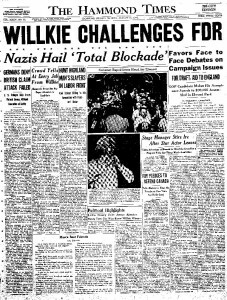 Read about Willkie accepting the nomination in the Hammond Times.